Online source for Greater Derry Area news and happenings by freelance reporter Carol Robidoux. 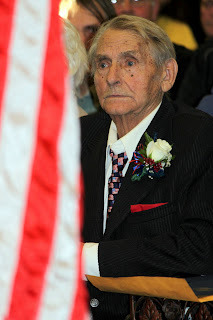 DERRY – Walter Borowski buried his face in his hands as town historian Rick Holmes pulled rank on him. “You have always denied you are a hero. Today, Mr. Borowski, you are out numbered. This room is filled with friends and family who know otherwise. Sgt. 'Whitey' Borowski, you are outranked,” said Holmes, in the preamble to the big event. Borowski, 90, whose heroism during World War II went unheralded for decades, yesterday received a Legion of Honor medal, France's highest military award. It was presented by the French Consul General, Christophe Guilhou, who is based in Boston. Upon learning of Borowski's participation in the D-Day invasion of Normandy as one of “Rudders Rangers,” cliff climbers who scaled the impossible cliffs under heavy attack by German forces, Holmes set out to see if he could arrange for Borowski to receive the medal. Adele Boufford Baker, NH's honorary French Consul, said yesterday that Borowski's fragile health made the trip overseas impossible. That's when she and Holmes got to work, and solidified arrangements to bring the medal ceremony to Borowski. Friends and family were joined by state and local officials, including the Town Council, several members of the legislative delegation, Gov. John Lynch, and staff and administrators from Borowski's alma mater, Pinkerton Academy. It was standing room only, as the atmosphere was festive and full of song, poetry, laughter and applause – and peppered with quips by Borowski made to the various speakers from his front-row seat. 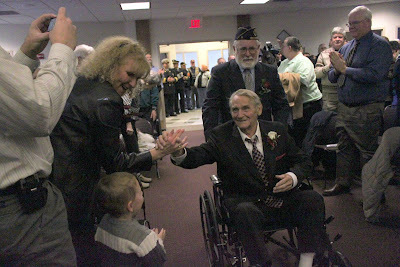 Other touching moments included an impromptu rendition of “Taps” played by one of Borowski's fellow veteran's, Buddy Madden. The room fell silent as Madden hit every note of the simple but moving traditional ode to those who fought and died for our country. “For you, Walter – and all those who never made it home,” Madden said. “Thank you, Buddy,” answered Borowski from across the room, as if no one else were there. 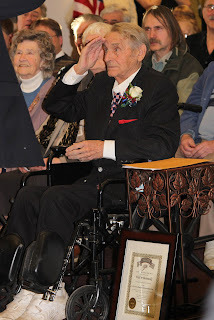 WWII Veteran Lewis Basquil of Manchester, who read about Borowski's story in the newspaper and came out to shake his hand, stood up from his wheelchair toward the end of the ceremony and shared his own story. He, too, had landed at Normandy on D-Day. And like Borowski, he, too, had lost a brother in combat on foreign soil. Tessa Borowski, 2, (right) will one day appreciate the legacy of her great-grandfather, Walter Borowski. 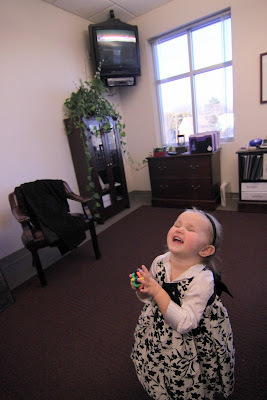 But yesterday, she was content to be playing in Town Administrator Gary Stenhouse's office while Borowski received the French Medal of Honor. 2010. Awesome Inc. theme. Powered by Blogger.